I recently spent almost a month shopping for the perfect mattress. When I finally picked one out and took delivery, it really wasn’t as good as I was expecting. 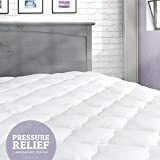 Thankfully, a friend put me onto eLuxurySupply Pressure Relief Mattress Pads, which are fantastic hypoallergenic mattress toppers that add a layer of luxurious comfort to any mattress. In fact, I sort of wish I knew about these before I spent all that money on a new mattress. These great mattress toppers are Amazon’s deal of the day today and every single size has been discounted, from Twin all the way up to Queen and King.